I didn’t know Sergeant Pepper was in the Kiss Army. I wanna rock your hand all night. Picture is unrelated.- Oops! Wrong website! They call me Dr. Pepper Love. “I lost my mind,” that must be the graphical designer talking. I used to want to “Rock and Roll all Night and Party Every Day”, but now I just want to take a nap every now and then. 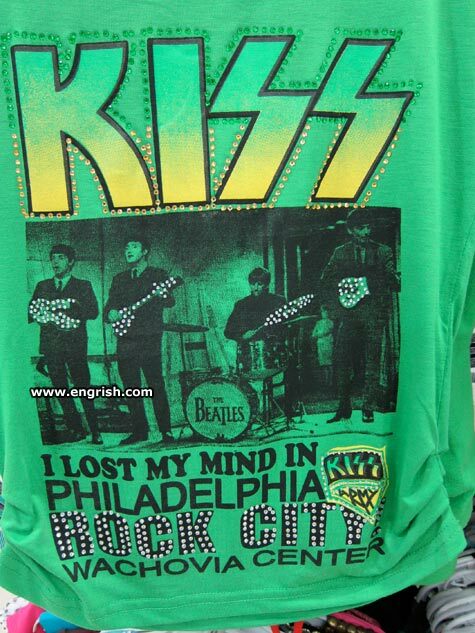 Philadelphia is a different kind of “rock” city. The Kissing Submarine was such a good movie. Those white spots on KISS’s guitars were really holographic projectors that made them look like the Beatles. I bless the rains down in Philadelphia- That’s a song by, like, somebody, right? Will you still rock me when I’m 64? I bless the rains down in Wachovia. If you’ve lost your mind, that explains why you couldn’t tell Paul from… well, Paul. I kinda like Twist and Shout it Out Loud. PS. Now we know who Arthur Brown ripped off his schtick from.